Ever-smiling Aussie professional Sarah Kemp has a habit of flying under the radar. And she has done it again with several weeks of consistent play to earn her first ALPG Order of Merit crown following the Australian summer of women’s golf. Now 33, and renowned as one of the sweetest swingers on the women’s tours, Kemp fulfilled a career goal when she played solidly throughout the Australian events and kept banking enough worthwhile cheques to take the title. 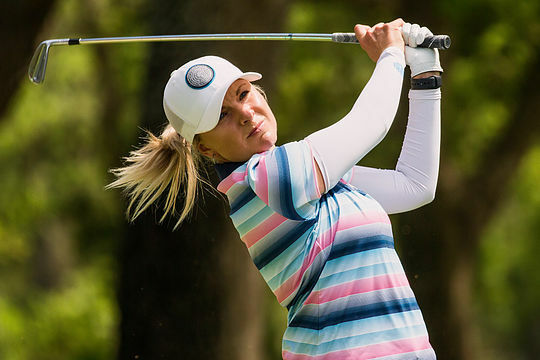 Kemp began her 2019 season at the ALPG Ballarat Icons Pro-am in the first week of February and didn’t really catch anyone’s eye as she finished in a tie for 42nd place. She then headed for 13th Beach for the ISPS Handa Vic Open, knowing that she had a great opportunity if she were to play well there, or at the other LPGA co-sanctioned event on the ALPG Tour in 2019, the ISPS Handa Women’s Australian Open. Kemp shot 70-71 in her first two rounds to be well placed, before a disappointing third-round 77 in tough conditions. She made the third round cut right on the number and began her final round at 7:54am, about four and a half hours before the final group, and stormed home with a scintillating 65 to finish in a tie for second place, taking home a cheque for more than $105,000. That alone meant she would be guaranteed a start in almost every event following the next “reshuffle” up the LPGA Tour categories in May as well as assuring her of an LPGA Tour card for 2020. Kemp followed that great week with another top 10 at the ISPS Handa Women’s Australian Open at The Grange GC. “I’m absolutely thrilled about where I am,” said Kemp.